Carpet Art of America is a family owned and operated company that is proud to have been serving the construction and design community of St. Louis since 1982. We have a custom area rug showroom carrying an extensive line of carpets including Mohawk, Shaw, Tuftex, Masland, Fabrica, Fibreworks, Kane, Stanton, Nourison and more. Our showroom, warehouse and fabrication workroom enables us to order, receive, fabricate, install wall to wall, install custom stairs and deliver area rugs with pads cut to fit. We are also equipped to apply everything from regular nylon binding and serging to leather and tapestry borders. 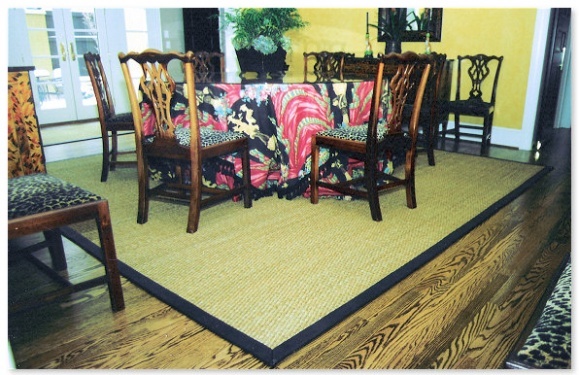 At Carpet Art of America we are dedicated to quality workmanship and excellent personal service. The possibilities in carpet design are unlimited and it would be a pleasure to work with you on all your custom carpet needs.